They are mainly of Disneyland Paris. We actually went on Thanksgiving Day. We're no traditionalists! This was an awesome day for Disneyland Paris, the weather was mild (for November) and virtually NO lines. When we did have to stand in line, it was only to let one group of people ahead of us go on. We got there when it opened and left when it closed, but we got to on every ride we wanted to and some over and over again...there was no need to come back (we had also been here in February 2009). After a experience like this, it's really going to take us a lot to want to go to Disneyland in California or Disney World (because of the crowds). This is Toby's "I'm about to do something incredibly naughty, but catch-me-if-you can" look. (Which we witness often.) A split second later he escaped under the bars and ran into an area where only employees were supposed to be. Scrumptious "Thanksgiving Dinner" of chicken nuggets and french fries. Wow...you can't tell these two are brothers, can you? The "It's a Small World" ride was changed up a little for the Christmas season. The park was decked out in Christmas decorations. It really got me in the Christmas mood! There's the proof. I've been there. And, usually, when he says it, he also shakes his head from side to side. "Oh, gosh dang it!" or just, "Gosh dang it!" Which he says with quite a bit of intensity. (Yes, I'm sending out Christmas cards this year--I ordered them yesterday--no, this is NOT the photo--James wanted a castle in the back ground). These parades are usually done in some of the German villages at night, on the 11th of November. But, Thomas' school does their own during the day (this year on November 9th), along with a brief assembly/play for the lower grades. Thomas getting ready for the parade around the school. "What do you mean I can't play on the playground?" You can't see it, but there is a small bonfire there. I understand the bonfires in the villages are pretty large, but they kept it small at the school. The children all received one of these after the parade, it's a pretzel. I Loathe Shopping on the Economy! I loathe shopping on-the-economy. But today, I just had to do it. After all, one can only go so long without a vacuum cleaner (ours broke last Wednesday). I went early (to REAL), 9 AM so Toby would be on his "best behavior". I was armed with treats in my coat pockets. He had just had breakfast 45 minutes earlier and a sippy cup of milk in the car on the way there. Nevertheless, he threw a yelling, screaming tantrum for no reason. It was awful. I had many locals either stare at me and say things that I didn't understand or actually get up in Toby's face. They also didn't like that he was standing in the back of the cart instead of sitting in the front (then provide belts that strap them in people!) I wanted to walk away and leave him, but I was afraid they'd throw him in a recycling bin (joking, and if you've lived here you get it, their recycling program is like a religion). 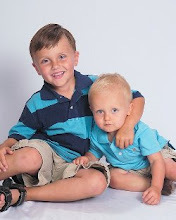 I ordered my prints from shutterfly.com, new updates of Thomas and Toby. Toby's came back really cute. Thomas' was in too low of a resolution so his were really blurry. You win some, you lose some, I guess. I ordered new prints, using this photo. I wish it was more current, this was taken at the end of July, but it's a cute pic.